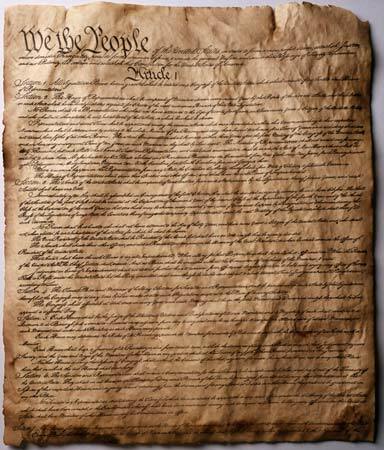 in this Constitution for the United States of America. to ourselves and our Posterity. consisting of a Senate and House of Representatives. consisting of a House of Representatives. Poet's Notes: A reconstitution of the Constitution, this pantoum, a Malay poetry form, reiterates what every civics student knows: the law is less than straightforward. In legal speak, it's a sub-optimization of thoroughgoing accessibility for non-inclined, reticent, or otherwise linguistically frustrated individuals, persons of legal status, all persons who fall under the purview of the specific municipality or legal framework of presiding jurisdiction. As repetition is meant to support retention, readers may consider this an exercise in absorbing some basic American civics. At least it's more comfortable than putting a legal textbook under your pillow or sitting for hours in a courtroom. Furthermore, in a time when the pluribus are late, and half the populace is waiting at one stop trying to go east while the other half is across the street trying to catch a ride west and another half is jumping up and down and up and down in the middle of the street wondering why everyone else is failing to read the schedule properly, it's time to return to the basics.